It is unclear when horses became domesticated animals, who had their own homes, the horse stable or barn. Dating back to the nomadic era, horses were essential to the lives of humans, but even the nomads did not have permanent human homes, so we cannot safely assume that the presence of a horse barn equals domestication. Through current day, horses are still an integral part of human life. As our relationship with horses has evolved, so have the homes we build for them. Here, we will briefly discuss the evolution of the horse barn. The earliest horse stables were erected in 1304-1237 by Ramses II in Egypt. Ramses II had his people build the largest stables, which covered over 180,000 square feet and was capable of housing 480 horses at any one time. His horses were bred and trained for war, hunting, and recreation. These horse stables were made of stone and rocks cemented together. Other ancient stone stables include those found in Israel, where Arabian horse breeding was a staple income. In Roman times, horse stables took up considerable space in the Roman Empire and some of them were even made of marble. By the Middle Ages, horse were considered valued members of a household. They were kept for working, transportation, and communication. Every farm had a horse and great care was taken to ensure the health and vitality of the prized animal. Horse stables in the middle ages began to take on more of the horse barn idea we know of today. However, in the Middle Ages, horse barns were built for function, not beauty, and were usually built as close to the house as possible — often times part of the house. Their aesthetic appeal left much to be desired, but they included hay lofts and room for the stable hands to sleep. Around the 16th century free standing horse stables became common and in the 17th century, they began to resemble the main home of the property. Materials that were used to make homes such as stucco, wood, brick, and stone were used. It became popular to build horse barns that looked like houses and included “stalls,” or rooms to separate sick or foaling mares. Victorian stables had specifications that improved the comfort of the horses and provided ventilation and drainage. By the 19th century, horses were considered the most valuable asset of a household and a lot of money was spent to showcase the wealth of the homeowner through the horse barn. With the invention of motorized vehicles, horses became less of a necessity and more of a luxury. During the Great Depression and World War II, most families could not afford to own a horse and found that the upkeep and long term cost of a car was less than that of a horse. Horse barns began to return to those more similar to the ones of the Middle Ages. 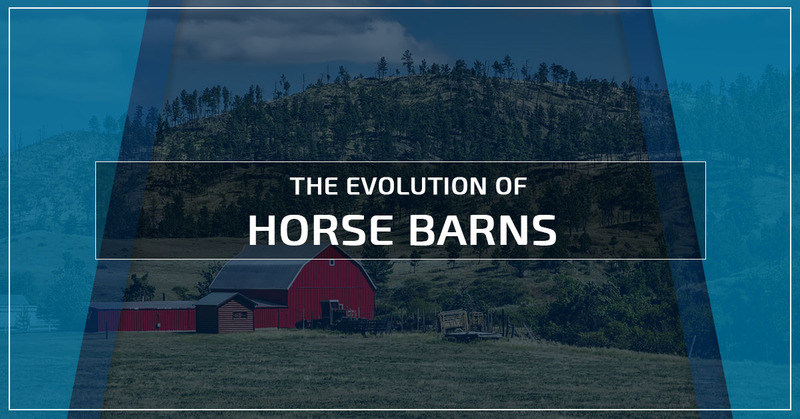 Horse barns were no longer a part of home and those horse barns that were attached to houses became a place to park a car — and thus the birth of the garage! In recent years, effective horse barns have transitioned to those built of steel. General structures made of steel helped to revolutionize the building industry. Equestrian structures made of galvanized steel was a significant leap forward in terms of benefits to horse and horse owner because it provides safe and secure accomodation for horses without the maintenance and upkeep of a traditional wooden barn. 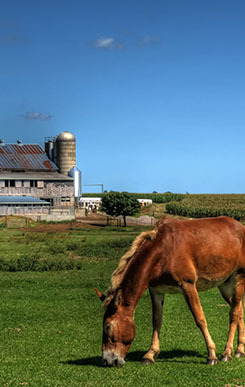 Erecting a steel horse barn is especially beneficial in the North Carolina humidity that would otherwise lead to the quicker decay of a wooden barn. We think the future of horse barns is metal buildings. They are incredible durable and cost effective. At Wholesale Direct Carports of North Carolina, our metal horse barns offer a comfortable home for your four legged friends and their equipment. We offer our standard layouts, which include our standard model with the sides enclosed and only the larger middle section open. Roll up and walk-in doors are available, along with windows and additional openings. The classic metal horse barn is a large middle section that is open with gables ends; on either side of the middle section is an enclosed garage or lean-to. View our gallery for style options and idea and then call our metal building experts for your obligation-free quote!